Gettysburg Licensed Battlefield Guide Stuart Dempsey is standing on Barlow’s Knoll, in the area of the statue to Brigadier General Francis C. Barlow. This view was taken facing southeast at approximately 4:00 PM on Friday, April 2, 2010. 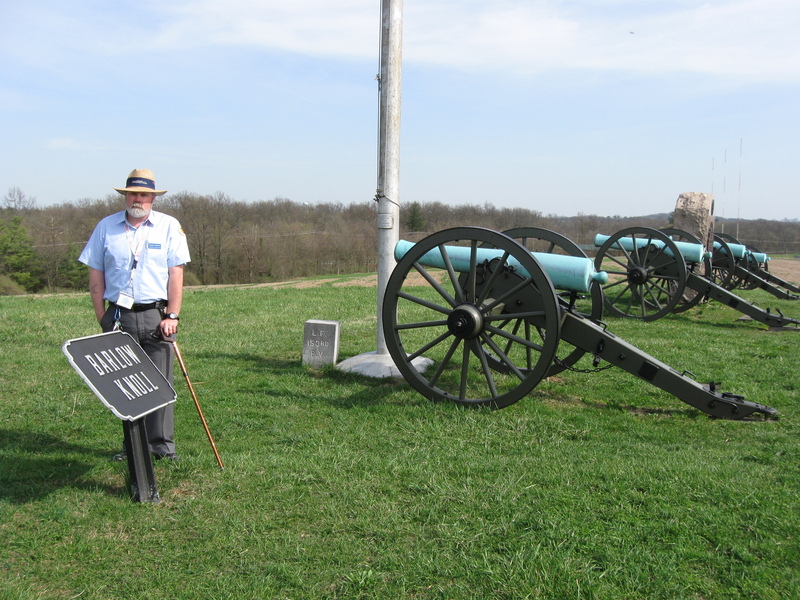 In today’s post, Gettysburg Licensed Battlefield Guide Stuart Dempsey shows us the topography of Barlow’s Knoll and how the placement of monuments on the knoll doesn’t exactly match the locations where troops were positioned. This map shows the location of where our Eleventh Corps at Gettysburg videos were produced. Videos #1-#53 were shown on other maps on our previous posts. Video #54 was taken on Barlow Knoll by the monument to Brigadier General Francis C. Barlow. Video #55 was taken on the summit of the knoll. Video #56 was taken near the monument to the 153rd Pennsylvania Infantry Regiment. This map was created facing north at approximately 6:00 PM on Wednesday, April 7, 2010. 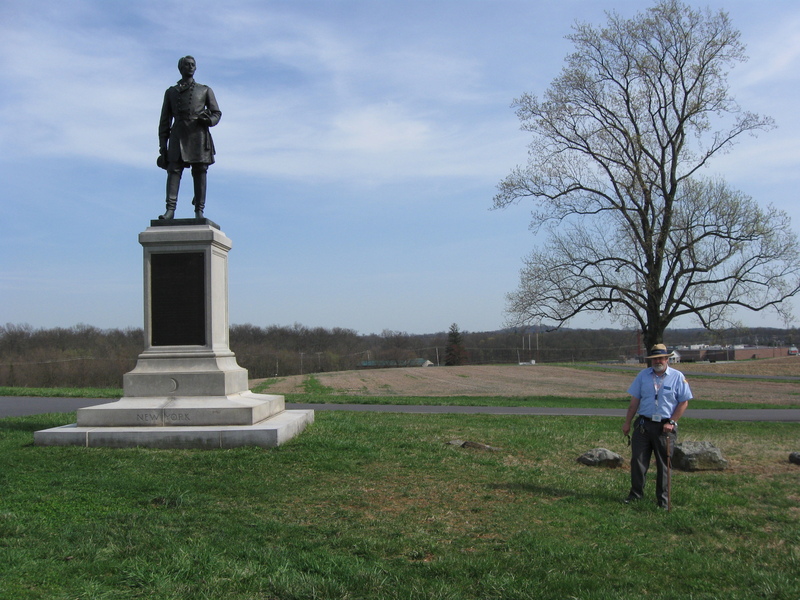 In Video #54 (Videos #1-#53 were shown in our previous Eleventh Corps posts) Gettysburg Licensed Battlefield Guide Stuart Dempsey is standing on Barlow Knoll near the monument to U.S. Brigadier General Francis C. Barlow. He recaps why Barlow moved his division to this knoll on July 1, 1863. This view was taken facing east to southeast to northeast at approximately 4:00 PM on Friday, April 2, 2010. Licensed Battlefield Guide Stuart Dempsey is standing on Barlow Knoll/Blocher’s Knoll. Besides the War Department plaque telling us where we are, visible in this view is the flagpole erected by veterans to the 17th Connecticut Infantry Regiment, the guns representing Lieutenant Bayard Wilkeson’s Battery G, 4th U.S. Artillery, and the left flank marker for the 153rd Pennsylvania Infantry Regiment. Not very visible, but just above the trees, is the light green/light blue water tank marking Hospital Hill/Camp Letterman. This view was taken facing southeast at approximately 4:00 PM on Friday, April 2, 2010. In Video #55 Licensed Battlefield Guide Stuart Dempsey is standing on the “summit” of Barlow Knoll/Barlow’s Knoll. He shows us the terrain, and compares today’s topography to how this area appeared in 1863. This view was taken facing southeast to east to northeast to north to northeast at approximately 4:00 PM on Friday, April 2, 2010. 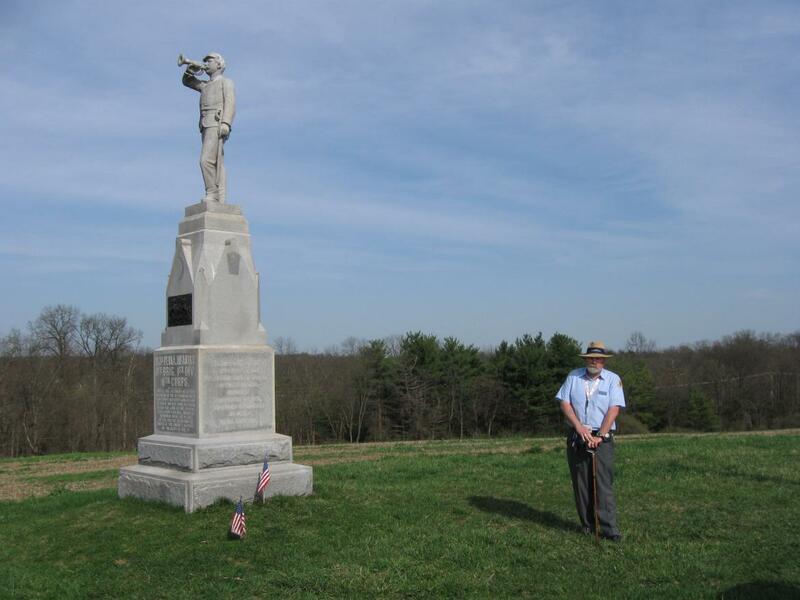 Stuart Dempsey is standing on Barlow Knoll near the monument to the 153rd Pennsylvania Infantry Regiment. This view was taken facing east at approximately 4:00 PM on Friday, April 2, 2010. In Video #56 Stuart Dempsey shows how the positioning of monuments on Barlow’s Knoll doesn’t exactly match the area where the soldiers were positioned on July 1, 1863. He specifically shows us what he believes is the true position of the 153rd Pennsylvania. This view was taken facing southwest to east to southeast at approximately 4:00 PM on Friday, April 2, 2010.